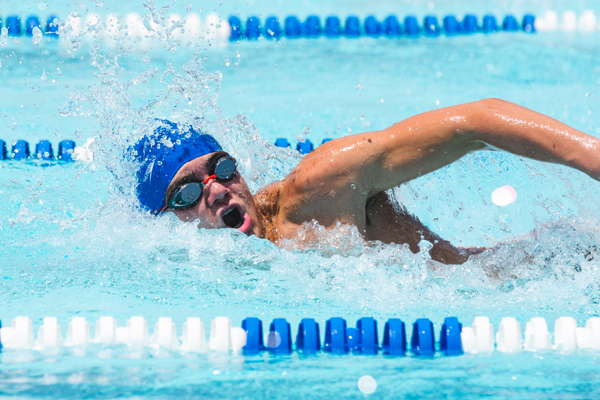 The Hillsboro Swim Team finished second at the home swim meet last week. The team had 995 total points and only lost to Hesston, who had 1,010.5. There were eight teams in the meet, including Lindsborg, Peabody, Abilene, Herington, Council Grove, and Solomon. Over 400 swimmers competed in 80 events throughout the day. Girls 9-10: 1. Lauryn Vogt – 1:16.15; 3. Sophia Dye – 1:27.99; 8. Talia Jost – 1:39.23. Boys 9-10: 10. Clayton Pretz – 1:50.30. Girls 11-12: 2. Trudy Hein – 1:26.36; 9. Violet Klein – 1:34.55. Boys 11-12: 2. Landon Dye – 1:20.71; 3. Gavin Priest – 1:22.77; 5. Lincoln Wichert – 1:24.80. Girls 13-14: 2. Macy Priest – 1:13.50; 3. Emersyn Funk – 1:14.63. Boys 13-14: 1. Tristan Rathbone – 1:07.75; 2. Frank Wichert – 1:08.44; 3. Duncan Duell – 1:09.83. Girls 15-18: 8. Sonja Jost – 1:15.96. Boys 15-18: 2. Brodie Rathbone – 1:04.05; 7. Jaden Priest – 1:08.82; 8. Dillon Boldt – 1:11.38. Boys 11-12: 1. Landon Dye, Adrian Unruh, Gavin Priest, and Lincoln Wichert – 3:00.72; 5. Zander Haslett, Owen Dalke, Dawson Boldt, and Romero Cruz – 3:51.46. Girls 13-14: 1. Emily Paulus, Ainsley Duell, Macy Priest, and Emersyn Funk – 2:35.42. Boys 13-14: 1. Duncan Duell, Connor Padgett, Frank Wichert, and Tristan Rathbone – 2:21.06; 4. Zachary Denholm, Lane Rogers, Eli Dalke, and Tristen Dye – 2:43.82. Boys 15-18: 2. Tucker Moss, Brodie Rathbone, Jaden Priest, and Dillon Boldt – 2:17.46. Boys 8-Under: Colt Bechtold – 32.46. Girls 9-10: 1. Lauryn Vogt – 17.67; 5. Sophia Dye – 22.31; 10. Nora Hein – 25.91. Boys 9-10: 9. Kainoa DeFiesta – 28.58; 10. Braxton Hiebert – 28.70. Boys 11-12: 2. Gavin Priest – 42.02. 10. Adrian Unruh – 53.85. Girls 13-14: 2. Macy Priest – 38.48; 5. Emily Paulus – 40.13; 8. Katie Rempel – 42.39. Boys 13-14: 1. Frank Wichert – 34.12; 5. Tristan Rathbone – 38.86; 8. Tristen Dye – 42.60. Girls 15-18: 5. Sonja Jost – 35.55. Boys 15-18: 3. Jaden Priest – 31.25; 4. Brodie Rathbone – 32.42. Girls 8-Under: 9. Brooke Klaasen – 37.31. Boys 8-Under: 2. Hudson Rogers – 25.45; 5. Colt Bechtold – 32.96; 6. Koehn Janzen – 33.82. Girls 9-10: 1. Sophia Dye – 20.85; 2. Talia Jost – 21.58; 8. Daisy Klein – 26.03. Girls 11-12: 7. Violet Klein – 51.28. Boys 11-12: 4. Landon Dye – 46.75. Girls 13-14: 5. Emersyn Funk – 42.56; 6. Emily Paulus – 42.72; 10. Ainsley Duell – 45.31. Boys 13-14: 1. Duncan Duell – 36.96; 2. Frank Wichert – 40.59; 4. Zachary Denholm – 41.60. Girls 15-18: 3. Sonja Jost – 37.34. Boys 8-Under: 2. Hudson Rogers – 20.10; 4. Koehn Janzen – 22.05; 5. Hudson Schmidt – 23.80. Girls 9-10: 2. Sophia Dye – 17.53; 4. Talia Jost – 18.55; 9. June Schmidt – 20.08. Girls 11-12: 2. Trudy Hein – 36.74; 9. Violet Klein – 41.22. Boys 11-12: 7. Lincoln Wichert – 37.97; 8. Landon Dye – 38.13; 9. Gavin Priest – 38.18. Girls 14-14: 2. Emersyn Funk – 32.03; 4. Macy Priest – 32.89; 7. Emily Paulus – 34.93. Boys 13-14: 1. Tristan Rathbone – 29.13; 3. Frank Wichert – 39.97; 4. Duncan Duell – 31.33. Girls 15-18: 8. Sonja Jost – 35.07. Boys 15-18: 2. Brodie Rathbone – 27.36; 7. Jaden Priest – 29.61. Girls 8-Under: 5. Khole DeFiesta – 35.61. Boys 8-Under: 2. Hudson Rogers – 28.53; 3. Hudson Schmidt – 30.64. Girls 9-10: 1. Lauryn Vogt – 22.62; 4. Quinlyn Funk – 25.53; 5. June Schmidt – 25.87. Boys 9-10 5. Aiden Hurst – 27.68; 7. Kainoa DeFiesta – 28.96; 10. Emory Dalke – 30.93. Girls 11-12: 6. Trudy Hein – 52.41. Boys 11-12: 3. Adrian Unruh – 53.19; 4. Lincoln Wichert – 55.89. Girls 13-14: 1. Ainsley Duell – 44.41; 2. Macy Priest – 44.63; 3. Emersyn Funk – 44.65. Boys 13-14: 1. Connor Padgett – 39.00; 2. Duncan Duell – 39.59; 4. Lane Rogers – 44.45. Girls 15-18: 4. Sonja Jost – 45.91. Boys 15-18: 2. Brodie Rathbone – 38.85; 6. Tucker Moss – 41.56; 9. Jaden Priest – 42.62. Girls 13-14: 2. Lauryn Vogt – 2:45.95; 3. Macy Priest – 2:49.76; 4. Emersyn Funk – 2:53.54. Boys 13-14: 1. Tristan Rathbone – 2:38.85; 4. Duncan Duell – 2:52.59; 6. Frank Wichert – 2:57.26. Girls 15-18: 5. Sonja Jost – 2:51.38; 8. Emily Paulus – 3:02.38; 9. Millie Sechrist – 3:09.73. Boys 15-18: 6. Brodie Rathbone – 2:43.05; 7. Dillon Boldt – 2:43.98; 8. Connor Hiebert – 2:52.50. Girls 11-12: 4. Trudy Hein, Gabi Sibayan, Rylie Driggers, and Violet Klein – 2:56.48; 8. Melonie Galvan, Ruthie Paulus, Gracelyn Just, and Austyn Driggers – 3:28.95. Boys 11-12: 3. Landon Dye, Adrian Unruh, Lincoln Wichert, and Gavin Priest – 2:32.49; 6. Owen Dalke, Zander Haslett, Romero Cruz, and Seth Driggers – 3:02.48. Girls 13-14: 1. Macy Priest, Ainsley Duell, Emily Paulus, and Emersyn Funk – 2:18.03; 8. Cheyenne Funk, Tylee Miller, Katie Rempel, and Tanner Plett – 2:44.62. Boys 13-14: 1. Duncan Duell, Tristen Dye, Frank Wichert, and Tristan Rathbone – 2:03.42; 4. Zachary Denholm, Bryant Dalke, Lane Rogers, and Connor Padgett – 2:24.87. Girls 15-18: 5. Millie Sechrist, Malorie Hein, Sarah Paulus, and Sonja Jost – 2:37.59. Boys 15-18: 2. Jaden Priest, Charlie Major, Dillon Boldt, and Brodie Rathbone – 2:01.65; 7. Connor Hiebert, Sam Herrel, Eli Dalke, and Tucker Moss – 2:30.01. Girls 11-12: 4. Trudy Hein – 1:44.83. Boys 11-12: 2. Gavin Priest – 1:40.10; 6. Lincoln Wichert – 1:46.01; 7. Landon Dye – 1:48.83. Girls 13-14: 1. Macy Priest – 1:25.50; 4. Emersyn Funk – 1:30.80. Boys 13-14: 1. Frank Wichert – 1:23.29; 2. Tristan Rathbone – 1:24.63; 3. Duncan Duell – 1:25.09. Girls 15-18: 2. Sonja Jost – 1:24.12. Boys 15-18: 3. Brodie Rathbone – 1:20.08; 8. Jaden Priest – 1:24.40; 10. Dillon Boldt – 1:28.75.